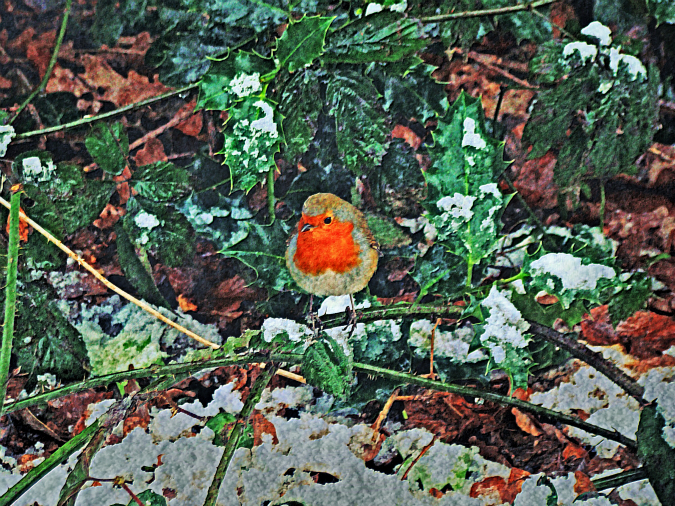 There is something utterly delightful about seeing a robin in winter, especially when there is a bit of snow around. Image (1) is the original, photographed using a Sony DSC-H50 camera. I edited images on my smartphone (Nexus 5) using Snapseed for image (2) and Aviary for (3) after uploading the original image to Google+ Photos. I then downloaded image (1) onto a Chromebook, and used Polarr to create images (4) to (7). In order to create images (8) to (10), I opted for Fotor and its HDR function, combinting images (1) to (7). Image (11) layered images (8) to (10) on Pixlr, and image (12) was created using iPiccy on the basis of image (11).